December 22 2017 8:16 am. my coworker (the driver) and i were traveling westbound on i-80 towards san fransisco on our way to work. 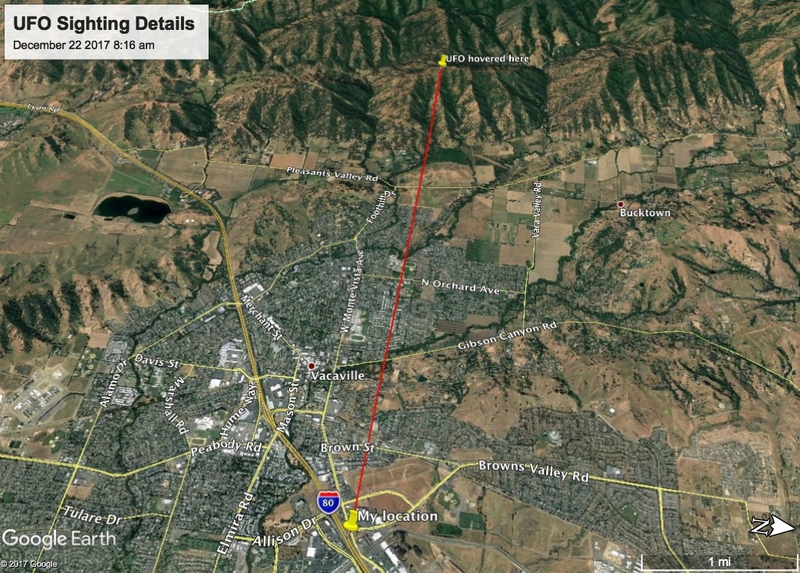 while passing the area of vacaville i noticed an object hovering over a hilltop in the distance. the size of the object would be about the size of an aspirin if held at arms length. it was cylindrically shaped (oriented vertically) it appeared larger at the top. the object was dark gray-black. it was very pronounced against a clear sky background. i saw the object intermittently as my line of sight was disrupted by traffic in the lane next to mine and an overpass that we drove under. for me, the event lasted somewhere between 1-3 minutes. i say it that way because i didn't see the object "arrive" and i didn't see it leave. so i can't say for sure how long it was there. during the periods that i had a direct line of sight to the object i could tell that while stationary it was either rotating around its y axis or changing shape. the larger part on top seemed to alternate between being on the left and right side of the object. the weather conditions during this event were relatively clear with very little cloud coverage. i would describe it as a bright and sunny california winter morning. i'm not sure what made me first notice the object, but as soon as i did my mind classified it was "odd." i drive that route several times a week and am very familiar with the aircraft in that area. travis air force base is only about 15 miles from where this event took place, so seeing military air craft as well as commercial aircraft is extremely common. along with airplanes and helicopters regularly seen in the area, its also quite common to see hot air balloons. in fact the first prosaic explanation that came to mind was a hot air balloon, but thats just not what i saw. first of all its out of season for for hot air balloons in that area. usually when you see them, theres always several hot air balloons together. hot air balloons are generally brightly colored, this was almost black, and it's shape wasn't correct to be a hot air ballon. the next explanation i came up with was one of those balloons that you would see above a car dealership or a new housing development. this however doesn't seem plausible because for one, that particular hilltop doesn't really have any buildings other then a few homes. for another, the size of the thing from the distance i saw it means it had to be much larger then an advertising balloon. seeing this object was exciting for me. full disclosure, i'm a ufo enthusiast. i generally keep an eye to the sky in hopes of seeing something of high strangeness. until now i've never seen anything that couldn't immediately be explained. i tried my best to take photos and video with my phone but it just wasn't large enough for my phone to capture it. my coworker also saw the object and acknowledged that it was indeed strange. he too said that it didn't look like "any hot aid balloon he had ever seen." i eventually lost sight of the object when we got close enough to the hills to block my view. i continued to look in the direction that i thought it may be the rest of the way to san fransisco.